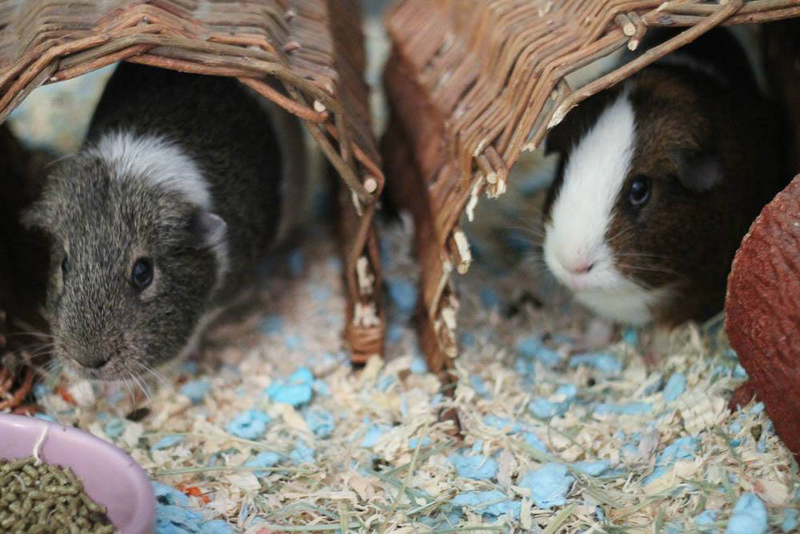 Keeping your guinea pigs’ cage clean is vital in keeping them healthy. A buildup of ammonia, for instance, can lead to a respiratory infection. Use the guide below to find bedding that works best for you and be sure to use it in a large cage. See our page on cages for information on the size and kind of cage to purchase. 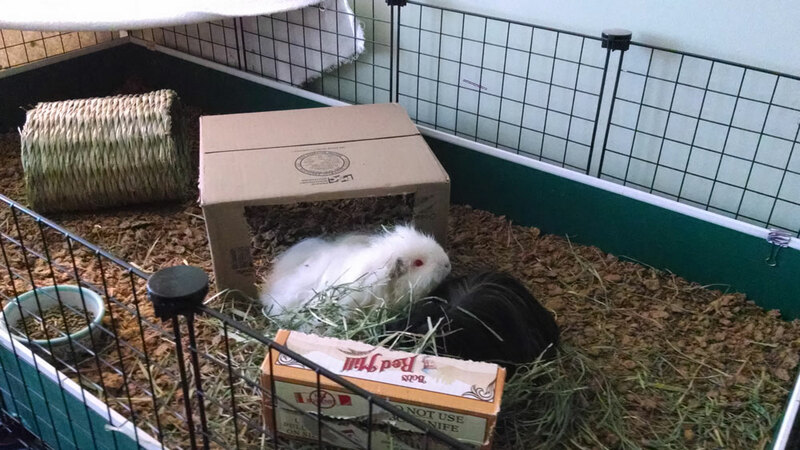 We recommend paper bedding, Aspen, or a blend of the two to those new to guinea pigs. Fleece also can be used but with fleece, you'll notice guinea pigs' poop more and need to sweep it (as well hay and other debris) off the fleece daily. 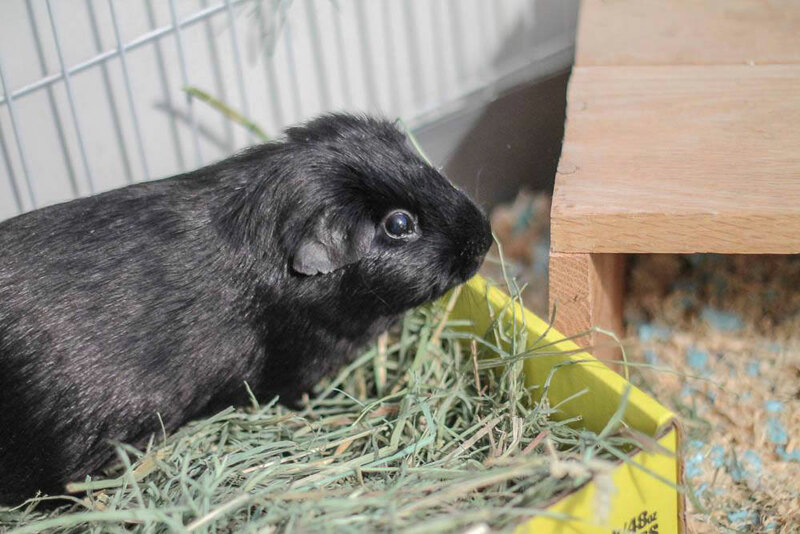 Seeing poop and having to sweep it up daily can be affronting to new guinea pig owners. Paper bedding is soft and absorbent and most brands contain minimal dust. 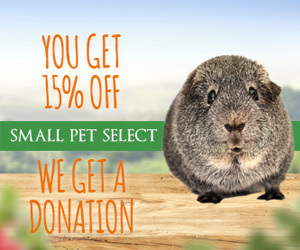 You can use the following coupon to get a discount and Small Pet Select in return gives us a portion of the sale. Aspen is the ONLY acceptable wood bedding. It is somewhat less absorbent than paper beddings and does not have paper beddings' odor control. It also tends to be lighter than most paper beddings, so it has a greater tendency to fly about when the guinea pigs run or jump in their cage. Aspen, however, tends to be cheaper than paper bedding. Paper bedding can be mixed with Aspen for cost-savings. Mix of Western Hemlock, Spruce and Douglas fir. Does NOT contain any Pine or Cedar (information received from Healthy Pet representative). After trying paper bedding, Aspen, and/or a blend of the two, you may want to consider fleece. When set up properly, fleece (a type of fabric) allows urine to pass through and into an absorbent material underneath. The fleece itself remains dry and hence the guinea pigs' bottoms remain dry. Fleece can be cost-saving in the long-run but whether to use fleece depends on your situation. With fleece, you'll notice pig poop more than you do with paper bedding. Seeing poop bothers some people. Almost everyone (whether the poop bothers them or not) has to sweep up the poop once per day so that the pigs aren't standing in it. 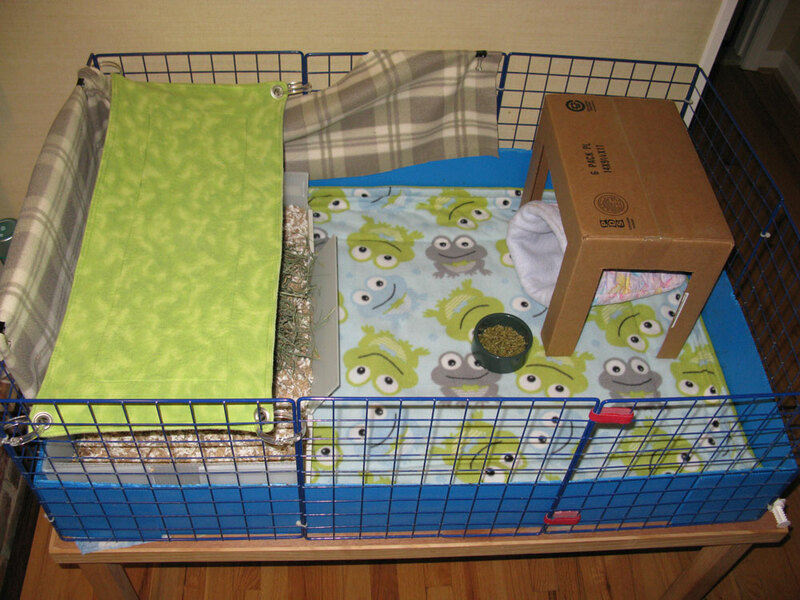 Sometimes owners set up the cage with a 'kitchen' that has paper bedding, Aspen, or a mix of the two in it along with the food dish, water bottle, and hay. That sometimes cuts down on the amount of poop on the fleece. But most pigs tend to poop everywhere and whenever, so you may still find yourself sweeping up poop off the fleece daily. And with a kitchen, you may find yourself sweeping up bedding dragged from the kitchen area onto the fleece. You'll need to be prepared to wash the fleece roughly every three to five days. When it comes time to wash the fleece, you'll need to sweep up the poop, hay, etc. The hay can clog a vacuum so most people use a small dustpan and broom to sweep up. Brooms often don't get all the fur or embedded hay off the fleece. To remove, some people use a rubber curry brush and/or a finger nail brush. Others shake the fleece outside. Removing as much fur and hay as possible reduces the mess you may find in your washing machine. When not removed, you may need to wipe down the inside of your washer and may find lots of fur and hay bits in your dryer's lint trap. Fleece can become smelly. Don't use any fabric softeners or dryer sheets. Both inhibit the wicking ability of fleece (you'll end up finding puddles of urine on the surface of your fleece). To remove odor from the fleece, you can add 1/2 to 1 cup of distilled white vinegar to the load of fleece in the washing machine (in addition to detergent without softener). What fleece and absorbent layer to purchase? You may need to use more than one layer and a combination of materials. Most owners find U-haul furniture pads and towels to be the most effective. 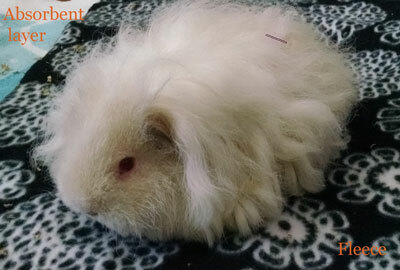 Fleece needs to be pre-washed before putting it into your guinea pigs' cage. If you don't pre-wash the fleece, it won't wick properly. Urine will pool on the surface of the fleece and won't pass through to the absorbent layer underneath. This will result in your guinea pigs getting wet, which isn't a good thing. Load the fleece in your washer. Add detergent and hot water. Don't add softener and don't use detergent that has softener in it. Dry the fleece after washing. Don't use dryer sheets. Once dried, test the wicking ability of the fleece. Place an absorbent layer beneath (such as a towel or furniture pad) and pour a bit of water on the surface of the fleece. If the water pools on the surface, repeat the washing and drying process a few more times before re-testing. If the water sinks through, the fleece is ready to be used in your guinea pigs' cage. Cedar gives off aromatic hydrocarbons (phenols) that are harmful to guinea pigs. Don't use cedar. Pine also gives off aromatic hydrocarbons (phenols) that are harmful to guinea pigs. Kiln-dried pine gives off fewer phenols and may be used, although with the variety of bedding available, it is best to choose a bedding that gives off no known phenols. Don't use pine. Corncob molds quickly and if ingested, can cause a blockage. Don't use corncob. Straw molds quickly and doesn’t absorb urine. Don't use straw. A wire floor cuts into and harms guinea pigs’ feet. Don't put your guinea pigs on a wire floor. Cat litter, if ingested, can cause a blockage. Don't use cat litter. Small animal potty training litter, such as Kaytee Critter Litter (Potty Training Litter) is made from material that are too hard. It will cause harm to the guinea pigs' feet. Litter/bedding for guinea pigs must be soft to the touch.